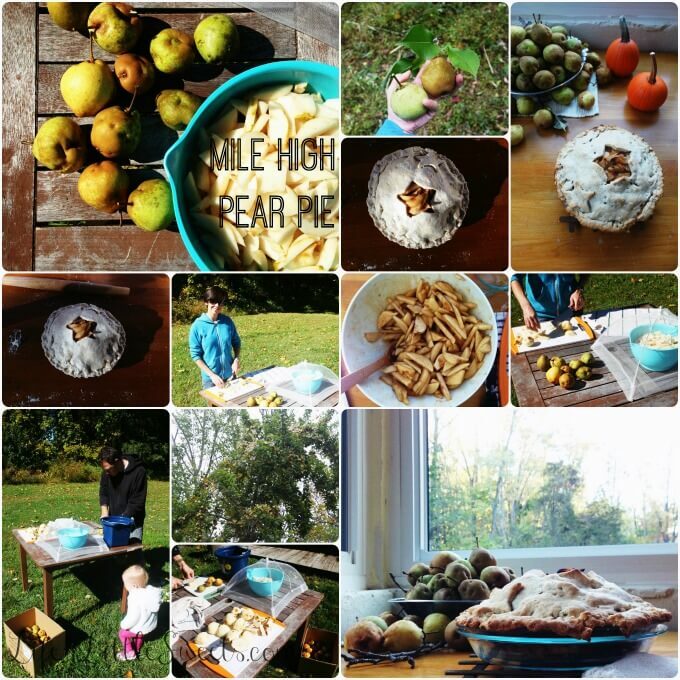 This rustic ‘Mile High Pear Pie’ is flavorful with natural sweetness using honey & coconut sugar, fragrant Ceylon cinnamon, crisp & juicy pears and a flakey, scrumptious, vegan double pie crust using coconut oil – enjoy this recipe on a Fall day after the pear harvest! I have some great news! We found a pear tree on our property. 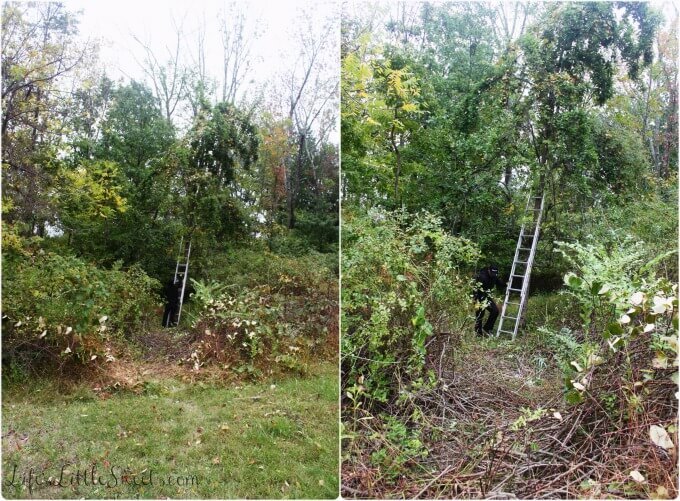 We have been in the house since our first night here on March 13th, 2014; during the first year, the tree did not bear fruit – this year it did! As you can see, we as in Eric had to pave a path though some nasty, invasive pricker bushes to get to it. We also have a winding path through the woods to access it but the below route is more direct. There is a creeping vine growing on it which has to be removed. I want to give this pear tree some TLC; I feel so lucky that we have it. I have always wanted to have fruiting trees where I live, I think they are marvelous. (Above) Eric is holding a feed bucket full of pears and this is just a small amount of the bounty that is still on the tree! I am not a pear expert but definitely a pear lover! Does anyone know what kind of pears these are? We live in Central, NJ if that helps. I have done some research online and they seem similar to the Bartlett or Anjou and within those types, there are probably so many varietals. In color, they are greenish-yellow and become a light yellow when fully ripe. They have a brownish, matte finish on parts of the skin and the skin is firm to the touch, edible but slightly tough. The cores are hard and sometimes grainy. They are crisp, juicy, sweet and flavorful. They maintain their crispiness even after baking (which I think is fantastic texture-wise). I estimate that the tree is about 30+ feet tall. (Above) You can see this past Saturday was a pear harvest day and the whole family (of 3) was involved. We are all in our Saturday morning, down-home, rolled-out-of-bed, the-hoodie-wearing-family style, you don’t mind, do you? Climbing up ladders and picking pears requires dressing for comfort, for sure. Eric and I did the picking, peeling mostly Eric and cutting, Margo supervised, directed and inspected the pears for quality and after, I baked the pie. I clearly didn’t get fussy to make the crust look perfect, this pie is homegrown and rustic! It tasted SO good and delicious. We brought it over to dinner at Eric’s Sister’s and everyone enjoyed it. All those apple pies I’ve made in the past and my appreciation for the pear has prepared me well for this Mile High Pear Pie. It’s my new favorite! Via my Instagram (below): This is a view of my kitchen table right now where I have a bowl of pears with pears literally spilling out of the bowl. I need to make more pear recipes to use all these pears up! 1/4 cup brown sugar *you can sub this with coconut sugar, , I just like to layer sweeteners for flavor depth in this type of recipe and I had brown sugar to use up! Preheat oven to 400 degrees F. PIE FILLING: Combine pie filling ingredients and set aside to marinate. Please note: when combining pie filling ingredients - sprinkle ingredients all over the sliced pears to coat evenly and then mix thoroughly. After chilling, using a dough scraper, divide the dough in 2. Roll one out 1/4" thick and place in a pie dish (you can try to roll it thinner but I find when using the coconut oil versus butter, having a thicker dough helps it not to break, and makes more flakey crust!). Poke holes in the dough with a fork in the bottom and around the sides of the pie dish. You can trim excess but remember to leave an overhang over the edge of the pie plate because this dough will shrink 1/2-3/4" in the oven. You can save the excess for decoration on the top. Cover the dough in the pie plate with wrap and chill in the freezer while you roll the top dough ball. Make any cutouts in the top at this time. I did a large star which also functions as a generous vent to boil down any excess moisture. You can cover and freeze the top at this point. Take out the pie plate with the dough and blind bake the dough for about 10 mins, in the 400 degree F oven, feel free to use pie weights, I did not and I didn't have any bubbling of the pie dough, it stayed in place! Take out of oven. Arrange pears tightly in the baked bottom pie shell, trying to minimize air pockets, press down if you need to, pour the remaining pear filling liquid over the top. It might seem like a lot of liquid and you can add a tablespoon or so more flour if you are concerned about getting a soggy pie (my pie was fine with the 2 tablespoons of flour and ample time to cool and set). Put top pie dough over pears and arrange any cutouts for decoration if desired. Press down gently over the top to push any air out and seal edges, I used the end of a spoon. Bake for 1 hour. Check on it 30-45 minutes in, to make sure the top isn't getting overly browned. Put a piece of aluminum foil with a circle cutout for a vent to reduce browning if need be (I did at 45 mins in). Bake remaining time. Allow to cool completely, this ensures it sets up before you cut into the pie. Enjoy! Recipe Attribution: I came up with the pear filling recipe myself (I’ve experimented for years with apple pies), trying to tailor it more to these pears I used. For the crust recipe, I really like the crust part of Lynne Rossetto Kasper’s “Pie in the Sky” and my recipe is inspired by her. I like listening to her radio show “The Splendid Table” whenever I get the chance. I loved this post! You tell a very good story, and include many descriptive details – bravo, Sara! Thank you Linda! 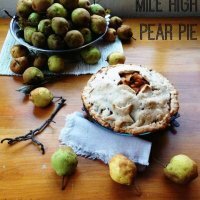 I hope you get to try some Mile High Pear Pie over the next weeks and upcoming Holidays, I will be making more for sure! Wow! What an incredible looking pie! I don’t think I’ve ever had a pear pie before! Hi Jessica, Thank you so much, pear pies are awesome, sending you a virtual slice! Given a choice, I’d choose to live on pie and what a great pie to start with. I have made my weight in apple pies and I have made apple and pear pies but never a pear only pie. My brain explodes at the thought. You’re my go-to blog for sweet recipes! This is super cool. I am beyond jealous that you have a pear tree! What a fun find 🙂 Pears are one of my favorite fruits and this pie looks absolutely delicious. Pinning! Hi Taylor, if you lived near me, I would give you a bucket of pears, seriously, there’s enough for everyone, I have to make another one of these Mile High Pear Pies soon so they don’t all get wasted! Thanks for stopping by! oh wow, that’s a lot of pears!! 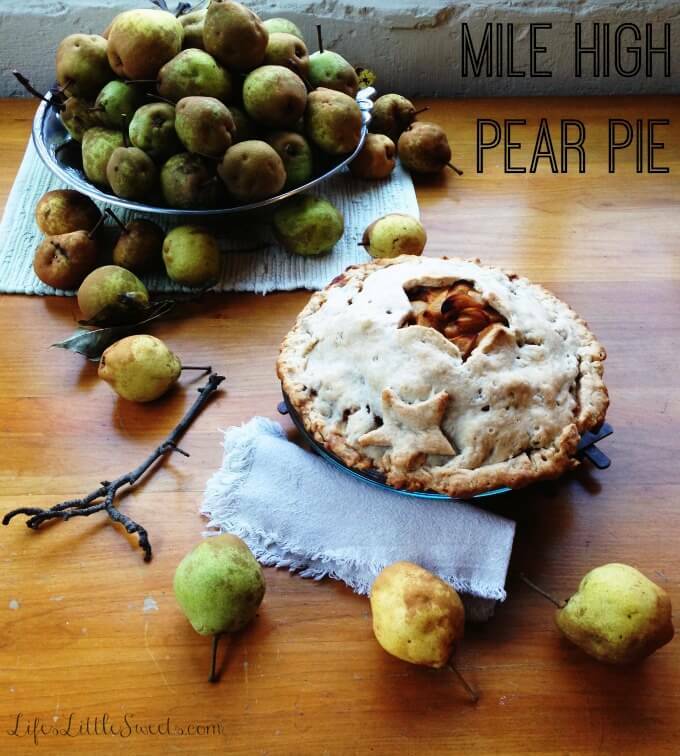 Love this pie and looking forward to more pear recipes from your kitchen! Ooo, that pie looks fantastic! Love the height – it’s so much more dramatic than the pies I usually make. I can’t wait to try this pear pie, what a delightful change from apple! This looks so good. 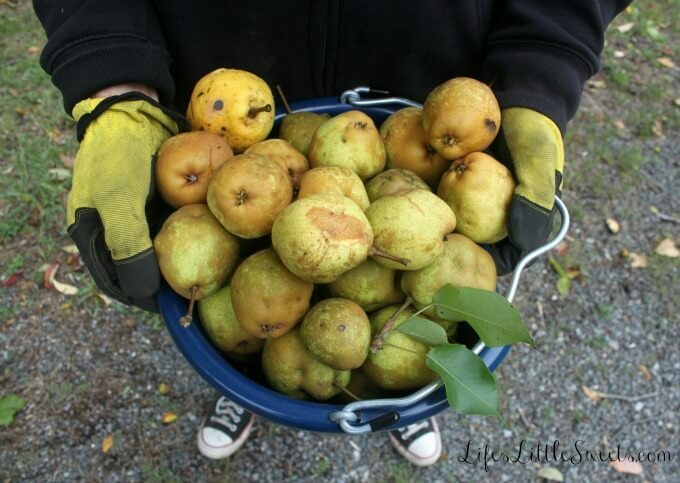 I have a bounty of pears, too, and I’m wondering, did you use the pears while they are still hard? Do they soften up baking? I want to make this, but wondering if you waited til the pears softened.